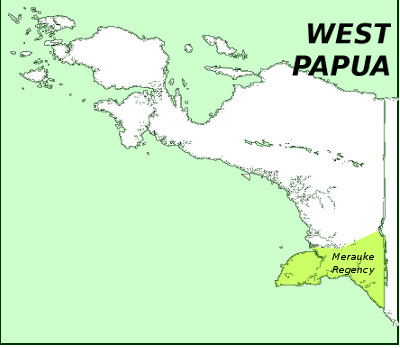 West Papua, where the MIFEE project is set to take place, is a conflict zone. The Papuan people have been struggling for decades for their freedom and self-determination. West Papua is also the next frontier for Indonesia’s plantations industry – after Sumatra and Borneo’s forests have been decimated for the pulp and oil-palm industries, now Papua becomes the target. Although some plantations already exist, MIFEE represents another order of magnitude, opening the floodgates to development projects across Papua in which the losers will be the Papuan people. awasMIFEE! has been created by independent activists in the UK as an act of solidarity with the social and ecological struggles of the people of Merauke and elsewhere in West Papua. We believe that it is important that people outside of West Papua also know what is happening in Merauke. However, information available about MIFEE can be confusing – much of it comes from different companies and government bodies, and each have their own way of describing the project that fits with their own interests and objectives. Most of all we hope that this information can be the catalyst for action! Our initiative is taken independently, because we believe in international solidarity, unconnected to the programs of any NGO apart from communication and collecting data. We hope it can also be a source of inspiration. * Background information – to understand MIFEE in the context of West Papua, it’s history and struggles, and the local Malind people. *What is MIFEE – how MIFEE presents itself as the answer to Indonesia’s food security needs. But is it actually just an excuse for oil palm and logging companies to conquer new territory? A look at the difference between the propaganda and the reality of development in Merauke. *Company Profiles: Tracing where the money comes from behind each proposed plantation. Which of Indonesia’s top business conglomerates are involved? How South Korean companies have been buying up plantations. How Australia’s top-selling sugar brand is connected to forest destruction in Papua. My name is Mary Baines and I am a journalist with Radio New Zealand International. I am doing a story on the plans for a sugar cane plantation in the Arus Islands. I was hoping to talk to someone from MIFEE to get some more details. Are there any links to Merauke or West Papua of the companies listed in the Greenpeace report about Proctor and Gamble? Possibly Musim Mas or KLK? Could be a focus for a campaign? saya putri asli Malind Yei, tepatnya dari Hulu sungai Maro. Hai orang Yei Berkacalah dari sodara-sodara kita di Baad, Senegi, yang sekarang menjadi miskin di Tanahnya sendiri. Uang tanah dipakai untuk berfoya-foya, sekarang menjadi miskin. Harapan orang Yei (BUPUL) yang sudah dapat uang tanah, uangnya bisa dipakai untuk modal usaha bukan untuk berfoya-foya, karena kalian sudah kehilangan sumber mata pencaharian (hutan dan Kali).